The American Association of Orthodontists states that the typical age of braces patients is between 9 and 14 years old. However, in recent years, more and more adults are getting braces to better their smiles, fix overbites, and to improve their overall dental health. Before you commit to braces, it is important to understand how much adult braces cost and what affects the price. Ceramic braces are a nice choice if you are concerned about appearance. They are similar in color to your teeth and are therefore less noticeable. Note that they are known to break. Ceramic braces run anywhere from $2,570 to $4,572 depending on your insurance coverage. Invisalign braces, as the name suggests, are nearly invisible. This type can be more affordable if you only have minor issues to correct. In fact, Invisalign braces are often classified as a cosmetic procedure by most insurance companies. The process involves the use of customized trays. Each tray costs between $80 and $300. Throughout the treatment you use different trays that are adjusted to your teeth, which means the overall cost can range from $3,500 to $8,000. Think long and hard before investing in Lingual braces. These braces are situated behind the teeth and are completely hidden from view. This may sound appealing, but the tongue often catches on them causing pain and they can impede the tongue resulting in speech issues. 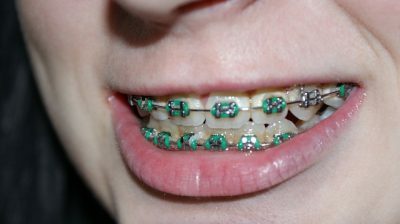 Lingual braces cost anywhere from $5,000 to $13,000 and may not be offered by every orthodontist. Tried and true, these stainless steel braces are still the most popular choice even among adults. They are affordable and not likely to break. The only draw back is that they are the most visible option. It is important that you take good care of your teeth throughout treatment to ensure there is no undesired tooth discoloration. The price range for adult metal braces is approximately $3,400 to $5,300 and depends on your insurance.